The five major districts of the Champagne area are: Montagne de Reims, Cote de Blancs, Vallee de la Marne, The Aube and Cote de Sezannes. 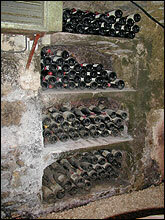 See the story "The Joenkoeping"
Contact us for any old vintages or maybe a Champagne you can't find. Playe and Entre - deaux - Mers. Location: Just opposite Pichon-Longueville Comtesse de Lalande and Latour, on the road leading from Saint Julien to Pauillac. Vineyards: 82 acres producing 20,000 cases. Grape Varieties: 75% Cabernet Sauvignon , 24% Merlot, 1% Petit Verdot . Average age of the vines is 25 years. 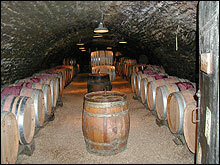 Vinification and aging: Fermented in lined cement vats and aged in oak barrels for 18-20 months. History: In the 17th century, the whole of the two Chateaux Pichon-Longueville belonged to Pierre des Mesures de Rauzan, an important landowner of the Medoc, whose daughter married Jacques de Pichon, Baron de Longueville. In the 19th century, Baron Joseph de Pichon-Longueville left two-fifths of the vineyard to his son Raoul, and the remaining three-fifths to his daughters, Comtesse Sophie de Pichon-Longueville, Comtesse de Lalande and Vicomtesse de Lavaur. Not having had descendants, Comtresses Sophie de Pichon-Longueville and de Lavaur left their shares to their sister the Comtesse de Lalande. In 1935, Baron Raoul de Pichon-Longueville sold his property to the Bouteiller family. In 1987 Pichon-Baron was sold, and Jean-Michel Cazes (proprietor of Chateau Lynch Bages and Chateau Les Ormes de Pez) brought in as administrator. Style: Supple and full of ripe cassis and black currant fruit. Food: Excellent with all red meats and game. tannins/ great wine needs some time. The grapes in great condition and made it a vintage of the century. 1984 poor weather early on damaged the Merlot, late rain ruined the Cabernet – need we say more ? 1988 Dry weather thickened the skins producing firm tannins that have taken some time to soften. 1990 A big crop of fat ripe grapes producing wonderfully rich wines with ripe integrated tannins. 1991 Frost in April reduced the yield and late rains diluted what was left ! Drink up ! 1992 a large Vintage of generally fairly dilute wines for the short term. 1993 Heavy late rains diluted many wines. Light pleasant early drinking vintage. 1995 More concentrated than 1993 or 1994 due to less rain and excellent conditions early on. good fruit and are drinking very well now. Prices are reasonable. 1999 A year that produced some big, fleshy, tannic wines, particularly in the Medoc. Top names, can offer good value. 2001 A good vintage but one which is overshadowed by its predecessor. Good balance, fruit and structure, wines typical of their appellations and good prices makes this a good choice. 2002 A Cabernet year and so impressive in the left bank. The right bank was more patchy. Spats between some of the most influential wine critics – time ( and taste ) will tell !! Chablis District, Cote de Nuits and Haute - Cotes de Nuits, Cote de Beaune and Hautes - Cotes de Beaune, The Cote Chalonaise and The Maconais. Some of the famous Villages are: Gevrey Chambertin, Vosne Romanee, Nuits St. George, Puligny Montrachet, Rully, Givry ... just to name a few. Domaine Jean – Pillippe Marchand – Gevrey Chambertin. The Marchand Estate was founded in 1813 by Pierre Marchand a small winegrower. He married Marie Jacotier who had inherited a small estate from her father. In 1983 Phillippe took over and bought the winery in Chambertin. The present building goes back to the 18th century and is used today for wine making, cellering and storing all on the same site. The Marchand holdings are in Chambertin, Chambolle Musigny, Saint Denis featuring some first growth wines like Les Sentieres at Chambolle, Clos des Ormes at Morey, Les Combotytes at Gevry, Griottes Chambertin and Charmes Chambertin at Gevry only to name a few. Most of the vines are more than 40 years old and the grapes are harvested by hand with great care. New and old barrels are used depending on the wines and Phillippe is personally taking great care so that top quality wines are produced. We are proud to work with Marchand and have developed our house wines supplied by him. These wines are highly recommended together with his fine wine selection from the area of Chambertin. This very large district is famou to produce the only Gamay wine to gain classic status. It is a light, purple coloured, fresh and quaffing wine that accounts for no less tha 6 out of 10 bottles of Burgundy produced every year. Well known are Beaujolais, Beaujolais Primeur, Beaujolais Superior and the well known Villages of Brouilly, Fleurie, Chenas, Julienas, Morgon etc. The river Loire is the longest one in France running from the source in the Gevennes Mountains and flows for 1000 km into the Atlantic at the City of Nantes. The variations of soil, climate and grape varieties found along its banks are reflected in the wide range of wines are grown in the 4 major regions. Grapes are Chenin Blanc, Chardonnay, Gamay, Cabernet Franc, Cabernet Sauvignon, Pinot Noir, Malbec, Sauvignon Blanc, Grolleau and many other varieties. Famous for it's full, fiery and spicy rich red wines and split into Northern and Souther Rhone. Famous wines are Rotie, Hermitage and St. Joseph in the north and Chateauneuf - du -Pape, Gigondas, Muscat Beaume de venise and 16 Villages which includes their own Village appellation. 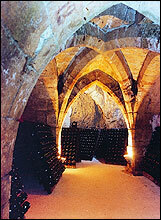 The well known Chateauneuf - du - Pape dates from the time of the dual Papacy of the 14th Century. The appellation is ell knownfor its amazingly stoney soil, which at night refelcts the heat, stored during the day. The size, depth, variation and distribution of these stones plus the 13 different grape varities account for the differnt styles. Regional Areas : The Jura and Savoie - Southwest France - Rousillon - Provence - Vin de Pays which include The famous Chateaux and rare vintages - Magnums etc. Since its inception in 1808, seven generation shave followed to built up one of the most magnifcant Domaine Ine the Rhone Valley. The Maison M. Chapoutier has progressively spread and diversified within the Heart-Land of the Hermitage, Crozes – Hermitage, Saint – Joseph, Ardeche, Cote – Rotie, Condrieu Chateauneuf-du-Pape, Bayuls, Coteaux d’Aix, Tricastin and Roussillon appellations. In addition to its own vineyards, M. Chapoutier controls the Vinification and often the cultivation of other Appellations which it commercialises : Cornas, Gigondas, Tavel, Muscat des Beaume de Venise In 1990 Michel Chapoutier took over the reins of this resolutely family-based and independent wines house. Under his guidance, it has continued to spread towards other French wine regions, and has even broken through it’s country’s frontiers to breach wine making in the new world, especially Australia. It has also undergone a radical change in cultivation methods, as Michel Chapoutier, a fervent defender of the Soil, has converted the entire Domaine over to bio – dynamic cultivation. Moreover, Michel Chapoutier’s pioneering spirit can be excemplified by his humanistic and innovative use of Braille labelling and by the creation of the award for the Best Young Sommelier of France. Michel Laroche had been watching the Languedoc with interest for over ten years when he found the right opportunity to invest and bought Mas La Chevalière in 1995. It is the region’s quality that specifically attracted him, thanks to the combination of over 2000 years of viticultural history and the range of grapes, soils and climates. Yves Barry, the winemaker, is French, but has considerable international winemaking experience. He works with Michel to produce a range of superior quality wines, each a true expression of its particular “terroir”. From the first vintage, the wines have won international recognition and awards. La Croix Chevalière is Michel Laroche’s ‘Great Red of the South’, made in very limited quantities and only in the very best years. It reflects the real heights of quality found in the best vineyards of the South of France. Wine quality is firmly rooted in the vineyard and Richard Lavanoux, MLC's viticulturalist, has made it his mission to seek out the most exciting plots of vines across the vast vineyards of the South of France. Altitude, stony soil, precarious slopes and old vines are all things he looks out for on his constant tours of the region. He and his team work closely with growers to reduce yields, pick late and train the leaf canopy for maximum fruit ripeness. Mas La Chevalière even breaks the local tradition of paying for grapes by weight (which encourages vineyard owners to produce higher yields, potentially leading to lower quality), and instead pays by area of vineyard, giving growers real incentive to keep yields down in favour of quality. The fruit for La Croix Chevalière is a blend of Syrah, Grenache, Mourvèdre and Cabernet Sauvignon, the proportions of which will change with every release to reflect the best fruit available. 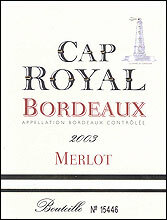 The Cabernet comes from the foothills of the Cévennes Mountains in the northern Gard, both the Syrah and Cabernet are taken from grapes in the Béziers region and the Orb Valley, the Grenache comes from the Maury vineyards in Roussillon, and Mourvèdre is from the Remoulins district of the Gard department. A high proportion of the grapes come from Mas La Chevalière’s own vines. The aim in the winery is to enhance the natural quality of the fruit. The grapes are all destalked and fermented at around 26 - 28ºC, with a yeast from the Rhône Valley. The young wine is left to macerate on the skins for around 3 weeks, and then run into barrels for the malolactic fermentation. It matures in French oak, with a high proportion of new barrels, for 18 months, where it is naturally stabilised in the cool cellar and then bottled unfiltered to preserve its complexity. It may throw a light deposit in time. Deep ruby red in colour, with inviting ripe berry and black fruit aromas, notes of bitter chocolate and a whiff of smoky oak and spice. It is rich, ripe and velvety in the mouth, with masses of lingering cassis and blackberry fruit, lovely texture and a superb balance of tannin backbone and acidity. 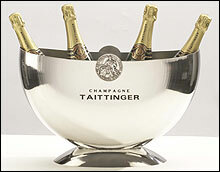 Serve at room temperature, and open 1-2 hours before drinking. A wonderful accompaniment to spring lamb, roast game birds and rare beef. Its ripe generous fruit makes La Croix Chevalière enjoyable now, but it will also keep and gain complexity for another 8 years. Bouchard - Chavy - Louis Latour - Louis Jadot - William Fevre - Baron Philippe Rothschild - Joseph Drouhin - Faiveley - Antonin Rodet - Engel - Domaine Claude Marechal - J Moreau - Laroche - Domaine R Luquet - Domaine Voarick - Domaine Lalande - Chateau de Jacques - Emile Chandesais - P David - Donatien Bahaud - Langlois Chateau - Alexis Deschamps - Paul Thomas - Jaboulet Vercherre - M Chapoutier - Barton & Guestier - Montesqieu. Please ask for a quotation, details on these vineyards or a wine you can't find!